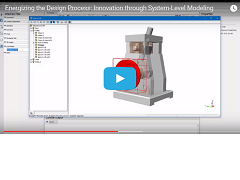 In this webinar, learn how the insight gained with system level modeling enables design to... Have confidence in the design with respect to function, performance, and robustness. Quickly test a variety of usage scenarios by modifying and analyzing important parameters. Deliver solutions faster as many design issues get highlighted in early stages. Find rigorous answers to hard design questions with system optimization.